As a Value Added Wholesale Distributor of gas equipment and appliances, we strive to offer only the best products and services available from a variety of manufacturers. Our mission is to provide our customers a single resource for products, facilities and services unmatched in the industry. We believe the expert product information and installation guidelines we provide distinguishes us from our many competitors. Our team of customer service professionals is dedicated to providing you the information to promote the safe and efficient use of propane, natural gas and gas equipment. water in one innovative system. Fisher continues to lead the industry in product quality, reliability, safety, service and support. Fisher equipment is backed by an exclusive five-year warranty program. 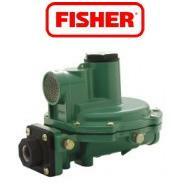 From regulators to valves, Fisher is a name to depend on. 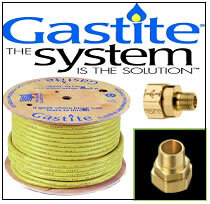 The Gastite system is a safe, time-saving and efficient method of installing piping for natural and LP gas. It utilizes corrugated, semi-rigid stainless steel tubing (CSST) with polyethylene jacketing and fully integrated, all-metal components. Gastite offers a complete line of tubing and accessories for direct burial applications. Ask about the GM/Gastite Frequent Buyer Program! Heatmaster Produced their first set of gas logs in 1984. Over the years the continued development of a unique log molding process has yielded the most attractive and realistic log sets available today. Their log sets are just as pretty for the 5 months a year when they're not in use as they are with a roaring blaze surrounding them. 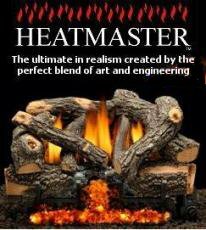 Heatmaster is " The ultimate in realism created by the perfect blend of art and engineering." 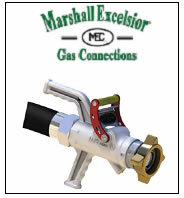 For over 25 years Marshall Excelsior Company has been a progressive manufacturer of top quality and competitively priced LP Gas equipment. They offer a full range of products that support the LP Gas Bulk Plant, Transport, Delivery/Dispensing, and Domestic Tank applications. Marshall Excelsior has become a name that customers can rely on for high quality products and services.